Ready to buy new patio chaise lounges for your community pool? A&K Enterprise of Manatee, Inc. has patio loungers at discount prices. Each patio chaise lounge is offered at a low, factory-direct price so that your association can have a commercial chaise lounge that fits your budget! Chaise lounge chairs from A&K are reliable, easy to maintain, and come with a chaise lounge commercial warranty. Made with a fully welded aluminum frame, each chaise lounge chair is designed to withstand the rigors of commercial outdoor use. Our poolside lounge chairs are easy to clean - just rinse with water in most cases. Plus, our pool chaise lounge warranty is designed to take the worry out of your purchase. We offer outdoor chaise lounge chairs in a variety of seat heights to meet the specific needs of your patrons. Each pool lounge is made in America with pride. Customize your pool lounge chair in any color at no additional charge! Commercial pool lounge chairs are the most popular item at community & resort pools. Commercial pool lounge chairs are stackable for easy storage in the off season and have a 4-position adjustable aluminum headrest, making them the top choice in aluminum lounge chairs. 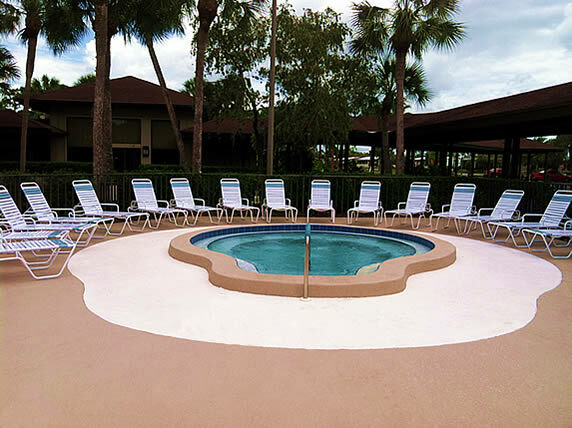 Commercial pool lounge chairs from A&K are made-to-order at our Sarasota factory where we make customized commercial pool furniture. Customize any of our commercial pool lounge chairs in any color combination at no extra charge. A&K Enterprise of Manatee, Inc. is an outdoor furniture manufacturer specializing in discount custom outdoor lounge chairs. We offer 16-inch and 20-inch high-boy sling lounge chairs and strap lounge chairs. We manufacture aluminum chaise lounges with either mesh sling and vinyl strap seating types.